Tj Jensen is just your typical soccer mom. She’s coaching the local girl’s team and heading to the state finals. She’s also volunteering at the local pumpkin festival. And when she discovers her good friend Zachary Collins dead in his chair at home and the local police close the case without much investigation, Tj takes it upon herself to make sense of Collins’ death. This was a quick, easy read and if you are a fan of cozy mysteries, this would qualify. But often, it’s too easy of a read. Author Kathi Daley definitely has chosen to emphasize character over story-telling. The story jumps around and Tj pops into a situation, asks some questions, makes a quick determination, then moves on even though her determination isn’t based on anything solid. One particular moment that I had to re-read a couple of times to make sure it wasn’t me that jumped to conclusions… In Chapter 13, Tj asks about a woman selling glass at a local flea market. A particular piece of glass may tie into foul play concerning Collins’ death. Tj is told the woman’s name and “She just recently moved to the area. Runs a little shop out of her garage.” When Tj meets with the woman later in the chapter she asks after a particular piece of glass the woman says, “I bought it from Dumpster Doug.” Tj asks where he might have gotten it and the woman – new to town, remember – says, “I’m sorry, I didn’t ask. I never do. Doug brings me a lot of items to sell, most of which are worthless, but every now and then he comes up with something good.” So… the woman is new to town but already knows the nick-names of at least one inhabitant and has established regular service with him. Possible, I suppose, but it is one of those cases that really stretches credibility and makes it look as though the author simply isn’t being careful. These are little things, but the little things add up – especially in a mystery. Daley is clearing more interested in establishing Tj as an ordinary person (who shoots the fastest game of pool) than in creating credibility. The entire book moves at this pace (fast game of pool; new person in town who has established contacts) which is why it is a quick, easy read. But I definitely like a little more meat and believability in my mysteries. I’m not likely to spend much time with the rest of the series if it moves like this. Looking for a good book? 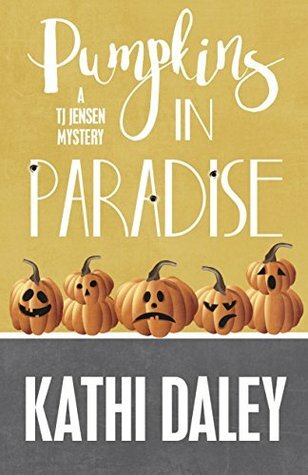 Pumpkins in Paradise by Kathi Daley is a cozy mystery that moves along quickly but pushes the bounds of credibility.